On my desk this week are the supplies that I have been using to make a card for the Mojo Monday Sketch Challenge. I love using these sketches for inspiration. 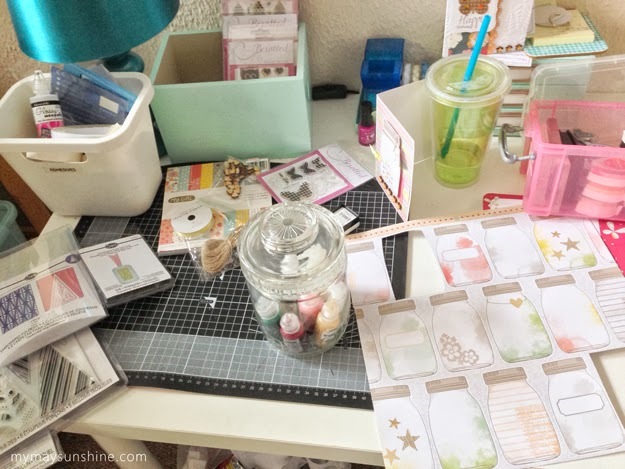 I tend to leave all my supplies out until the card is finished so that I can write down what supplies I have used, for when I put the card on the blog, if I don’t I would never remember. Not tidying as I go tends to drive me crazy as I am the type of person who tends to keep a clean desk as my desk isn’t very big. Also on my desk are some Sizzix items that I won from Paula Pascuals blog recently and want to start using them for Christmas cards and projects. Right I’m off to sort out a sentiment for the card. Linking up to Julie @ Stamping Ground. Previous Post woyww 227 – what’s on my desk.